Tuesday on my way to coffee, I heard rising star and comedian Wyatt Cenac interviewed on NPR’s Morning Edition program. He talked about, among other things, being funny and about his gig as a Daily Show correspondent. He also spoke of his frustration over a controversial advertisement put out by an animal rights group. He’d turned his reaction into a stand-up comedy bit, excerpted by NPR during the show. The ad juxtaposed an image of an American 19th century slave, chained and scarred, next to an image of a shackled circus elephant. Cenac was floored that such a comparison was being made. I understood Cenac’s response. There is some history that is so horrendous and cruel and barbaric, it’s wholly inappropriate, not to mention ineffective, to use it to further another cause. But while I don’t blame Cenac for taking offense, my hope is that instead of writing off the plight of captive elephants, he’ll use the opportunity to look at the conditions so many circus and zoo animals endure. I hope that he’ll recognize that the suffering of circus elephants is no joke. The interview reminded me of the story of another circus elephant — and the man who eventually became her caregiver. Shirley, an Asian elephant snatched from her family in the wild, was brought to the United States half a century ago and forced to travel with the circus. Wild elephants are used to walking 5 to 15 miles per day. Females, particularly, are social creatures. They live naturally in groups, thrive in the company of others of their species, communally raise their calves, even mourn their dead. For 30 years, however, Shirley was regularly whipped and assaulted, crammed in a tiny enclosure when not in the circus ring, deprived of freedom, exercise, comfort, and companionship. And when she was too badly maimed to continue performing, Shirley was basically discarded. At that point, a Louisiana zoo agreed to take the elephant, so for next 20 years, Shirley lived in virtual isolation in a concrete pen. 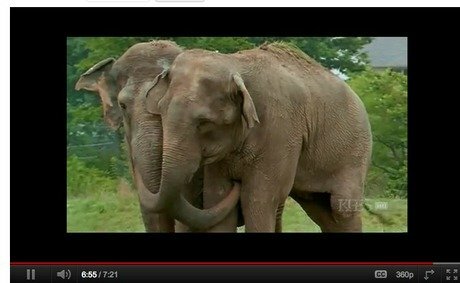 (Not as much was known then about elephants’ need for companionship from members of the same species; like dogs and humans, they are meant to live among others.) The only living being Shirley knew during this time was zoo caregiver, Solomon James (see below). One doesn’t get the sense that the soft-spoken Southern man has much formal education or that he gets paid handsomely for the work he does. But as James speaks of his many hours with Shirley and his attempt to provide her some semblance of companionship to help salve the loneliness, one senses an inherent wisdom. A man rich with compassion. For over two decades, James cared devotedly for the elephant. No species, religion, race, or gender owns the rights to suffering. Some experiences are more horrific than others, no one can deny that. But the degrees of distinction between acts of brutality (if they can even be measured) are infinitely less stark than the distinctions between kindness and cruelty, between freedom and slavery, between suffering and the absence of suffering. I’d love for Wyatt Cenac to watch these spots. I believe that those of us who are pained by the anguish of another individual, whether human or beast, now or in the past, has an obligation to help abolish that suffering. Reserving humane treatment for a single species may be acceptable to some, but I believe that respect and kindness for all who share this planet will not only transcend our individual worlds, but will perpetuate compassion in a way that’s genuine and global and enduring.